Tarantino has been making westerns for quite a while now. Many of his stylistic nuances come from the limitless westerns he’s seen over the years. Plenty of other genres have influenced him, but Japanese cinema and westerns seem to be his biggest influences. You would think then that an actual western by Tarantino would incorporate those stylistic elements so seamlessly that you wouldn’t even notice the Tarantino-esque quirks. But no, Tarantino leaps off the screen yet again in Django Unchained. Fortunately all of those quirks are as effective here as ever before. There’s the in-your-face and unconventionally effective soundtrack, the leaping pans and zooms of the camera, the massive text graphics rolling across the screen, and of course the dialogue, the wonderfully fun dialogue. All of it wrapped around a solid story. The story is set two years before the American civil war and follows Django (Jamie Foxx), a slave. Django is taken in by Dr. King Schultz (Christoph Waltz), a bounty hunter who needs Django’s help to identify a band of fugitives. In return for his help, Schultz will give Django his freedom. The pair bond, and Schultz eventually goes on to teach Django his trade and help him on a quest to rescue his wife Broomhilde (Kerry Washington) from Calvin Candie (Leonardo Di Caprio), a plantation owner with a lust for violence. The opening third of the film is largely a vehicle to show off the delightful eccentricities of Dr. Schultz. A man who is excellent at inviting weapons to be drawn on him, and equally excellent at explaining to his would-be assailants why they are being rather foolish. Of course, if that doesn’t work, Schultz is damn good at using his own weapon too. Schultz is easily likeable, Django is a bit more stand-offish, but the bond between the two develops nicely. Enter Calvin Candie. Up to this point Django is simply a ripping yarn, Candie brings some real conflict to the proceedings. He enjoys mandingo fighting, that is, forcing slaves to fight each other to the death so that he and others like him can bet on the outcome. In demonstrating how horrible this is, Tarantino uses all of his violent filmmaking skills. It’s not exciting violence, it’s not a cinematic spectacle. It’s damned upsetting. It begins to scrape the surface of what slavery actually means. It starts to cut through the 150 years of airbrushing history has done to give the vaguest of glimpses at a dark time in American history. Once you are thoroughly discomfited by the world, Django and Schultz put their plan into action, posing as slavers to get to Broomhilde. Django must portray himself as ok with the horrors Candie exposes him to. Something with which the once heartless seeming Schultz has more difficulty. Schultz begins to fear that Django is losing himself and becoming overly desensitised to the violence directed at the slaves. The seriousness of these themes is somewhat broken up the comic relief offered by Candie’s head house slave, Stephen, as played by Samuel L. Jackson. The crotchety nature of Stephen’s racist attitude toward other black people is designed to illicit laughs, and it does so well. But in Jackson’s hands this humour doesn’t distract from the menace as Stephen begins to see through Django and Schultz’s plans. The last act, natually, is pure violence. 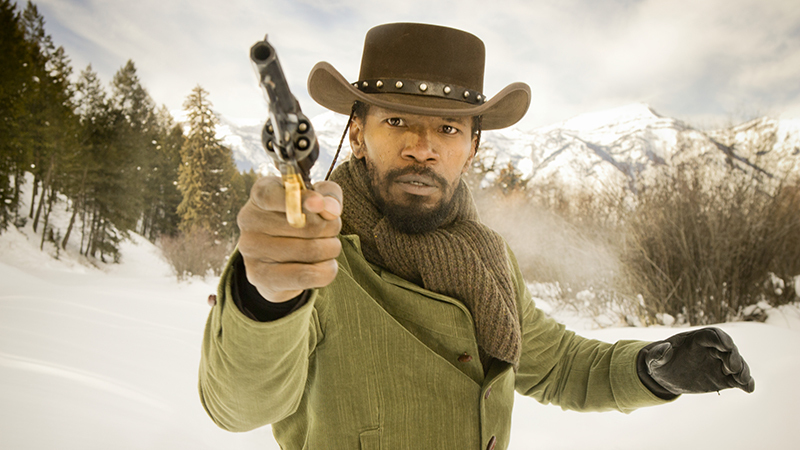 Django breaks out his inner badass and bullets and blood are sprayed liberally. It’s everything you would expect from Tarantino. The film almost makes you feel guilty about how enjoyable it is. You should not feel so entertained by a film that reminds you of what slavery is. But Tarantino has a deft hand, and he balances things well.